Last night, I got out of my kitchen to take my first real cooking class. After years of teaching Asian cooking classes to kids, I finally got a chance to play with food myself! What a great learning experience. 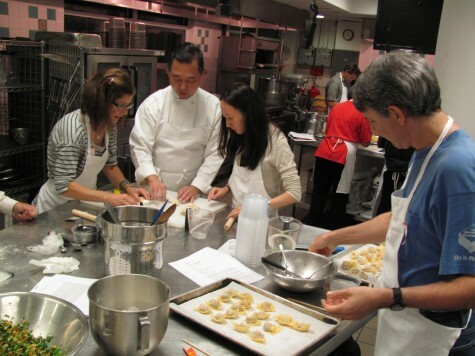 The four-hour, $120 workshop was called “Discovering Dumplings.” It was held at the Institute of Culinary Education on W. 23rd Street in Manhattan’s Flat Iron District. The glamorous classroom was an open space with glass sliding doors. It was packed with gleaming stainless steel tables, counters, appliances and wire racks. There were multiple refrigerators, stoves and sinks. I was very impressed with myself for being there. I felt even more important once the instructor got things going. Kian Lam Kho presented an insanely ambitious lesson plan that really taught me a lot. The workshop ran from 6 to 10 p.m. We needed every minute because there was a ton of material to cover. Kian demo’d the making of three types of dough (cold water, hot water and sticky rice flour dough) plus eight dumpling shapes. We also learned that these treats can be steamed, boiled, fried or, prepared using a combo of techniques. A true pot sticker, for instance, is thrown in the pot raw, then somehow cooked and fried. But the vegetarian dumpling, which is made with a sticky flour wrapper, has to be steamed in a steamer before it’s fried in a pan. We practiced making eight different recipes. 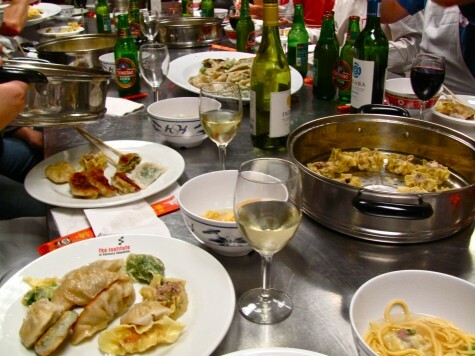 The menu included: wonton, shao mai, shrimp dumpling, vegetarian dumpling in sticky rice flour wrapper, pork pot stickers, beef and celery jiaozi, fish and dill jiaozi and Shanghai soup dumplings. 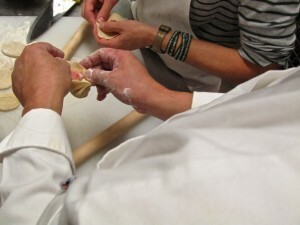 The 14 students were divided into three squads with each group making three types of dumplings. During this workshop, I finally — finally! 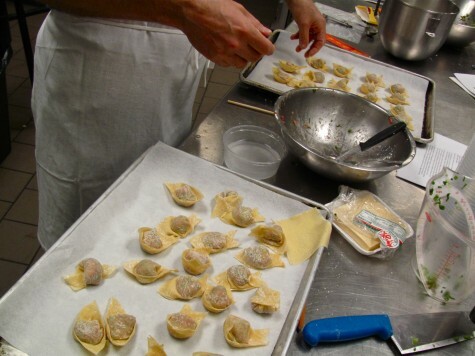 — learned to wrap wontons. There’s a move involved that’s tricky for lefties like me. Two of my patient squad mates, Andi and Valerie, walked me through the steps over and over until I got it. Working with them was such fun. In fact, the workshop was filled with nice people (and only one or two annoying ones). TIP: The easiest way to peel ginger is to take the edge of a spoon and scrape the skin off. Kian says he’s usually too lazy to grab a spoon and simply uses the back edge of his favorite cleaver. But you have to be careful; don’t cut yourself. Yes, cleavers are scary-looking knives. 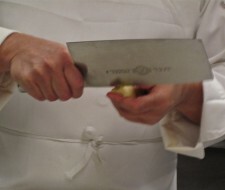 But very handy for the chopping prep required in Chinese cuisine. 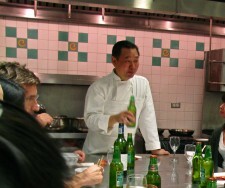 Another tip…Kian, who is passionate about classic Chinese cooking, explained that “real” Chinese cooks don’t mix ginger in pork dishes. The Chinese trinity of aromatics — ginger, garlic, scallions — is featured in most recipes, in part because ginger counteracts the animal taste of meat. But pork is considered neutral and not game-y enough to need it. Even though I’m very do-your-own-thing in my approach to cooking (and life), I appreciated learning the rules. As I always tell my journalism students, we need to know the rules so that when we break them, we’re aware of what’s happening. So yes, I’ll still use ginger with my pork dishes. But now, I understand that it’s a creative decision. By 9:30 p.m., we were ready to sit down and sample our handiwork. To be honest, they were, um, interesting. Some dumplings were too hard or too big, too lumpy or too soggy. Then again, a few were quite tasty. Judging from the happy chatter around the table, we had had an excellent learning experience. 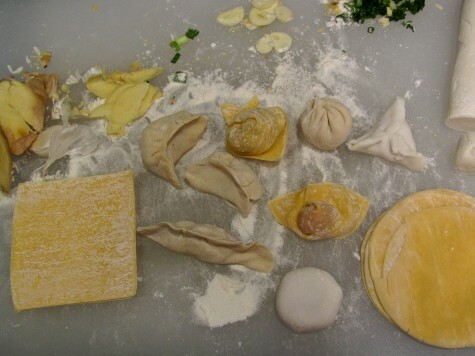 Who knew making dumplings required this much skill. The dough has to have just the perfect elasticity. Kian says to do it by touch; the texture has to feel right. And will I do that? Hmmmm. Maybe. As Kian noted, making dumplings is a great party activity. Everyone can get involved. I’d also love the chance to create my own fillings. So we’ll see! That was former Peter Kump Cooking School, right? It recalled my memory about my taking FIRST pastry and cheesecake recreational classes there. That’s a lot of fun!! It was less than 10 years ago, by then, FREE breakfast & lunch were served by the cooking school intern during our class and the fee was about $100 for 6 hours. During the session one, I spilled all the “hot beans” from the removable baking container after taking the crust out from the oven. I wanted to dig up a hole to hide myself. It was a very hilarious burn accident! I really burn my hand! A few years ago, they cut back the session hours and NO more free lunch and breakfast. yes shirley, ice is the former peter kump. love reading your happy memory of your classes. just like you, we were fine about our screw-ups. my group never did get the dough right for shanghai soup dumplings. but this was so about just being there in real time. i can’t even imagine trying to duplicate the learning experience by reading a book or watching a video. even a demo isn’t enough. 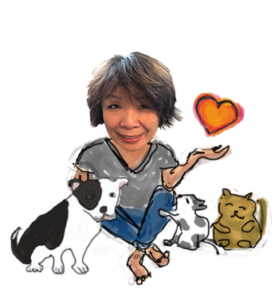 the workshop reinforced my belief in the importance of trying things out. have to remember that when i struggle with writing or painting — and when my students sweat over my homework assignments. like kian said, practice! btw, how nice that you got free lunch and breakfast during your cooking classes in the old days. our session included a small platter of cheese, crackers and grapes (at the start of class) and beer and wine at the end. you know, kian was actually quite flexible about our results. i don’t think he mentioned an exact size for pot stickers. if you try them out a few times, then you’ll know what works. in terms of bursting, there was one dumpling where he suggested that we make sure we seal it up only AFTER making sure there were no air pockets. that’s what makes them explode, the air bubbles. at least, i think that’s what he meant!